The customers and the customer orders are the heart and soul of a WooCommerce store. You need to regularly manage, maintain, and update the users and orders in the shop. When the store has a large user base, these tasks become difficult doing manually. In cases where you have hundreds or thousands of users on your store, updating or migrating the data will not be possible without the help of a plugin. The Customer Import Export plugin and the Order Import Export Plugin for WooCommerce are the best plugins that allow store owners to generate a CSV file for both customers and customer orders. These plugins will save you a ton of time and a lot of effort. Let’s take a look in detail what both these plugins can do. WordPress Users and WooCommerce Customers Import Export Plugin can make the exporting of the customers with just a click of a button. Not only can you export the WooCommerce customers, but you can also decide which users and which data related to that users should be exported. If you want only a portion of users to be exported, or you want only a certain data related to the customers to be exported, the plugin has got you covered. Also, if you want to export a single customer and customer data, or if you want the selected customer details, not in the sequential order, the plugin helps you do that too. All the features, documentation, and a live demo for the plugin can be found on the product page of the plugin. After you have installed and activated the plugin on your WooCoomerce store, you can go to the plugin page and just click on Export Users from the Export Users in CSV Format section and it will download all the users and user metadata into a CSV file. The CSV file will then be downloaded on your computer. But the capabilities of the plugin go beyond just exporting all the users and user data. The settings of the plugin can be configured in such a way that it gives you the power to decide what you want to export from the WooCommerce shop. The fields in the Export section lets you configure what users you want to export and which data related to that users should be exported. The fields User Roles, Offset, Limit, Start Date, and End Date allows you to filter the customers that will be exported to the CSV file. The Columns field allows you to select which data regarding the customers you want to export into the CSV file and also change the corresponding column name in the CSV file. You can export the customers from the WordPress Users page as well. From this page, you can bulk export all the users and all the metadata into a CSV file. Other than that, from the user page, you can export a single user, or you can export selected users that are not necessarily in a sequential order or belong in a specific date range. Whatever method you choose to export the products into the CSV file, the data will be flawlessly exported to a CSV file and downloaded on your computer. You can export the CSV file on to the server on a scheduled regular interval as well. Configure the settings for the scheduled export, and all the user data you need will be downloaded to the remote server on a regular interval. Now, let’s see how we can export the customer orders from a WooCommerce store. To export the customer orders from a website, you don’t have to go far away to search for a plugin that can do that effortlessly. Order/Coupon/Subscription Export Import Plugin for WooCommerce can help you export all the orders from the WooCommerce store into a CSV file or an XML file. The features, documentation and the demo for the plugin can be found on the product page of the plugin here. Much similar to the users export, the orders can also be exported just by a click of a button. After installing the plugin on your website, by clicking Export Orders button, the entire orders and the related data will be exported to a CSV file or an XML file depending on your choice. Now, the plugin lets you filter the orders that are exported based on the order statuses. Also, the fields Limit, Offset, Start Date and End Date helps you export a partial list of data. Configure the settings of the plugin according to your requirement on how you want to export the orders. Also, decide which order metadata you want in your exported file and also change the column header name if needed. You can export the orders from the WooCommerce Orders page as well. You can select individual orders to export and bulk export them to a CSV file or an XML file. 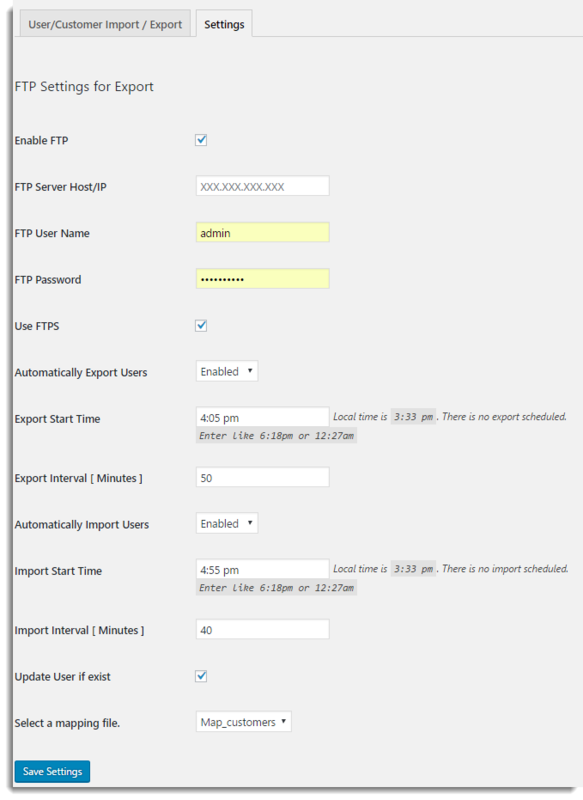 You can also export the orders to a remote server at regular intervals by scheduling the Cron job. The orders in the CSV file are connected to the users by the user ID. This makes it easier to link the orders and users in case of a migration. In this case, it is important to note that the users are imported before the user orders. This article covers some of the main features of the plugins to export users and user orders. User Import Export and Order Import Export have free versions that provide basic functionalities of these premium versions. Both plugins help save a lot of time and effort for WooCommerce store owners. This entry was posted in Blog, WooCommerce, WordPress Users & WooCommerce Customers Import Export. Bookmark the permalink.